The Wain House Bunkbarn01873 890359work BunkhouseGroup accommodation in the Barn, The Wain House.This old stone barn used to house the market cart up to 50 years ago (think of The Hay Wain by Constable). It now has sleeping accommodation for up to 16 people. Perfect for groups that want to get out into the wild open spaces and return to basic, cheap accommodation that provides warmth, drying facilities and where dinner can be eaten sitting round the woodburning stove. Perfect for two or three families that want to ride in the school holidays or where adults may wish to let their children do the riding while they explore the valley on foot or by car. 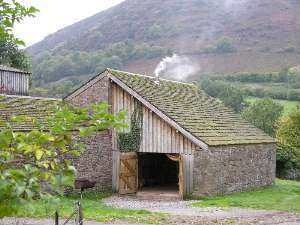 Group accommodation in the Barn, The Wain House.This old stone barn used to house the market cart up to 50 years ago (think of The Hay Wain by Constable). It now has sleeping accommodation for up to 16 people. Perfect for groups that want to get out into the wild open spaces and return to basic, cheap accommodation that provides warmth, drying facilities and where dinner can be eaten sitting round the woodburning stove. Perfect for two or three families that want to ride in the school holidays or where adults may wish to let their children do the riding while they explore the valley on foot or by car.